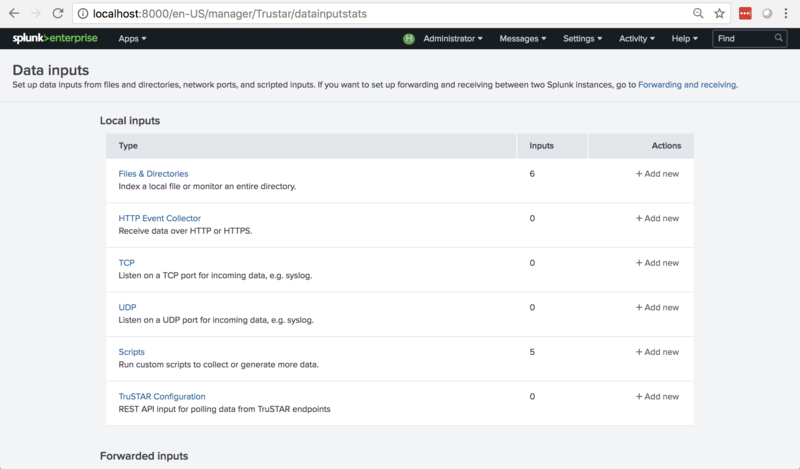 This article provides a description of the Splunk App built for TruSTAR and a step by step guide to install, setup and troubleshoot the TruSTAR App for Splunk. The Splunk App allows users to utilize context of TruSTAR’s IOCs and incidents within their Splunk analysis workflow. TruSTAR arms security teams with the high-signal intelligence from sources such as internal historical data, open and closed intelligence feeds and anonymized incident reports from TruSTAR’s vetted community of enterprise members. The details below summarizes the prerequisites and requirements. Please make sure below components are downloaded/available. 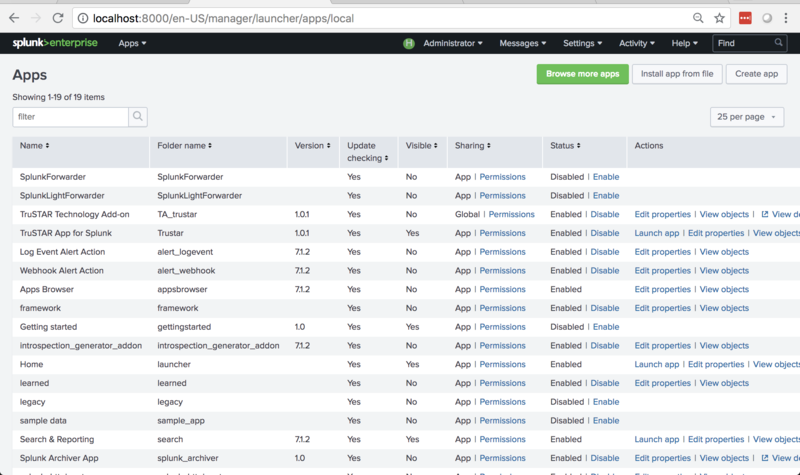 Splunk Enterprise 6.5.0 or above. Environment Variable: Set environment variable SPLUNK_HOME. You'll need to download the bundles in this table. Links to the downloads are below this table in the "Installation" section. This bundle will fetch reports and IoC data from TruSTAR using modular input and indexes it which then can be searched. This bundle will need to be installed first. This bundle will have all the dashboards to display data received from TruSTAR Station. 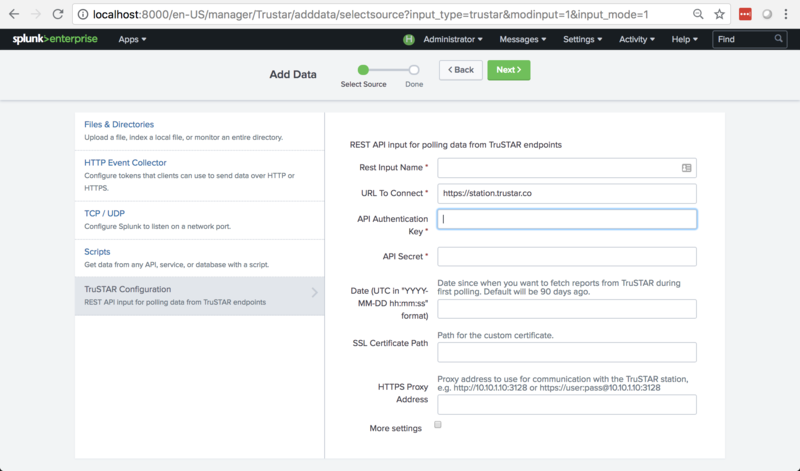 The installation process for TruSTAR app will be different based on your Splunk environment. Click on Install app from file button in upper right area of the "Apps" pane. Upload the Technology Add-on splunk file. Repeat step 2 and upload the TruSTAR App file. After successfully uploading the two files scroll down the App Configuration section of this page and follow that section's instructions. In a single server deployment, single instance of Splunk Enterprise works as data collection node, indexer and search head. In such scenarios, install both TA-trustar and TruSTAR applications on this node. Complete the setup of TA-trustar for starting data collection. In a distributed deployment, Splunk Enterprise is installed on at least two instances. One node works as search head and other node works as indexer and data collection node. The TruSTAR Application only needs to be installed on the search head node. The TA-TruSTAR addon needs to be installed on all indexer and data collections nodes. If you have a separate data collection node, please ensure it’s running the full Splunk Enterprise version. Complete the setup of the TA-trustar on data collection node(s) only. You do not need to do a setup on search head node. In Splunk Cloud, the data indexing will take place in cloud instance. The data collection can take place in on premise Splunk instance that will work as heavy forwarder. TA-trustar must be configured first. Log in to your Splunk instance (If using distributed Splunk the data collection node). Click on TruSTAR app from left bar. On the "Trustar Configuration" line, Select "+ Add new". Click on More Settings if you want to customize index name and polling frequency. Leave it at default values if unsure. This is a name you assign to the input. It can be whatever you want it to, but must be unique to each Modular Input. Authentication Key to connect to TruSTAR station. It will be used for making API calls. Available under Settings-> API in your TruSTAR Station account. Text entered into this box will appear in clear text while you fill out the Trustar Configurations settings box, but after saving the REST input's configurations Splunk encrypts it for long-term storage on the hard-drive in Splunk's /storage/password entity. On edit of modular input this field will be blank. Secret Key to connect to TruSTAR station. It will be used for making API calls. Available under Settings-> API on TruSTAR Station. It will appear in clear text in the text box while you fill out the Trustar Configurations settings box, but after saving the REST input's configurations Splunk encrypts it for long-term storage on the hard-drive in Splunk's /storage/password entity. This app will fetch all reports from the enclaves you specify in the "Enclave IDs" field that are timestamped between the date you specify in this field and present. For optimal performance set this date to be no earlier than 7 days (168 hrs) before present date/time. File path to SSL Certificate that will be used when this app makes API requests to TruSTAR Station. No need to give path if you use a CA-signed certificate. Enable Data Collection Yes Enabling data collection will start the polling of data from the TruSTAR enclaves specified. Interval in seconds. All API calls will get executed on this TruSTAR station at specified interval. "sourcetype" is a standard Splunk field. This setting allows you to select a "sourcetype" from a list of options, write one in manually, or allow this app to set the value for this field automatically. Default behavior is to allow this app to set this value automatically, which is done in this application's code. This parameter allows user to decide which index to be used for TruSTAR data. User needs to ensure that index is already present in the Splunk environment. If no value is provided, by default it will use “main” index. If you did not make any changes for destination index in App Configuration then skip this section. If you change the destination index for source from “default” you will need to follow these steps. Open the Search Head UI. Go to Settings-> Advanced search-> Search macros. Select "TruStar App for Splunk" in App Context dropdown. Modify `trustar_get_index` macro definition with index=”<new index name>”. NOTE: There is no need to modify `trustar_get_index_and_sourcetype` macro. TruSTAR app consists of following dashboards.The dashboard shows count of Reports and Indicators Imported and Matched in All time and Last 4 hours. Matched Data :This panel displays 4 single values of Matched data. Count of Matched Reports in Last 4 hours and trend of count with previous 4 hours. Count of Matched Indicators in Last 4 hours and trend of count with previous 4 hours. Count of Matched Reports in All time. Count of Matched Indicators in All time. Imported Data: This panel displays 4 single values of Imported data. Count of Imported Reports in Last 4 hours and trend of count with previous 4 hours. Count of Imported Indicators in Last 4 hours and trend of count with previous 4 hours. Count of Imported Reports in All time. Count of Imported Indicators in All time. This screen displays Report details like name, creation time, distribution, last scan and result count of matched for specific report. User can see this dashboard on drill down of Report Name from TruSTAR Reports dashboard. It displays all details of specific report like name, total indicators count, report body and table of all related indicators. User can investigate the indicator in raw events and also perform actions like marking an IOC as false positive so that it is not considered it in future matches. This screen displays basic details of indicators like time of download, value, count of co-related reports, status, count of matched reports. Also user can perform actions like investigate IOC in raw events and mark an IOC as false positive so that it not considered in future matches. User can upgrade TruSTAR app and TA through CLI or UI. This section describes the overall App architecture. TruSTAR App for Splunk can populate the panels based on the index defined while indexing data into the Splunk. By default data will get populated under “main” index until it’s changed while configuring data input. Splunk recommends using Splunk’s default index (that is “main” index) for simplicity and reusability. Refer below URL to create custom index. Note: In case changes are done in Index name, Please follow steps mentioned under macro section. Source-Type are default Splunk fields to categorize and filter the indexed data to narrow down the search results. Since TruSTAR app collects two different types of data from Trustar Station, it has been indexed in below source types. Below is the table, which shows alerts and activities data are separated. This contains all the reports sent from TruSTAR station to Splunk using rest API call. This contains all the indicators sent from TruSTAR station to Splunk using rest API call. All the visualizations in TruSTAR App for Splunk are referred by a “trustar_get_index” macro, which helps App to identify the Index in which data is getting indexed. By default, it’s referred to “main” index and in case user is changing the Index value then same changes has to be done in the macro. TruSTAR App for Splunk has another macro called “trustar_get_index_and_sourcetype”, which helps App to identify the index and sourcetype in which indicators of TruSTAR app should be matched. By default, it’s referred to index=* and in case user has some specific index and source type to consider to find matches,then it should be updated in the macro. There is a known limitation in Splunk where TruSTAR App Icon doesn’t get updated without restarting Splunk. Hence, it’s recommended to restart post installation of the TruSTAR App to load the App Icon. There is a known limitation in Splunk Modular input that in case of failure it doesn’t show proper raised error message, but shows generic failure message on UI in windows machine. After completing installation of application, all the dashboards will start populating data. Confirm that you have modified macro `trustar_get_index` with indexes selected while creating Modular input. To verify this go to Settings->Data inputs->TruSTAR Configuration. Check index field for each entry in list view. For example, If all modular input entries have index=default in 2nd step, then update macro definition with index=main and save. If any specific index has been set in modular input then add it in macro definition. Verify that SPLUNK_HOME is pointing to correct Splunk directory. Look for errors in trustar_modinput.log file. This file will be available under $SPLUNK_HOME/var/log/trustar folder. In case Authentication Key or Secret key for your accounts is modified after setup in Modular Input. Open specific TruSTAR station entry, and enter new Authentication key and Secret Key in both fields. On click of save, modified key will get updated for that specific TruSTAR Station. Please check out our comprehensive Splunk FAQ's here. For other questions reach out to support@trustar.co for any additional questions.